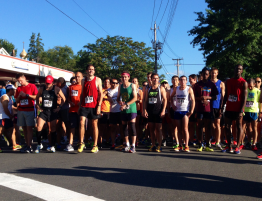 Another Masters Challenge 5K race is in the books and RRR made history by capturing its first title in the Men’s 40 category. It was Taconic RR’s turn to host the annual midsummer event for runners age 40 or older, and our running comrades from northern Westchester coordinated an excellent outing, held Wednesday, August 1 at F.D. 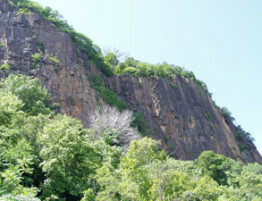 Roosevelt State Park in Yorktown Heights. The 3.1-mile course had some rolling hills and a half-mile groomed gravel path that made for a pleasant if semi-challenging route, made a bit tougher by hot, muggy conditions on race evening. RRR handled the course supremely well, grabbing four of the top spots to dominate the M40 division. Matt Goldstein, in training for the NYC Marathon, led the RRR parade home with a winning time of 19:05. Wojciech “VT” Cieszkowski, organizer of the popular Harriman Park weekend runs for the club, finished second in 19:54, followed by Jamie Kempton in fourth (20:39), Logan Scott, fifth (20:56), and Glenn Coleman, 12th (22:37). 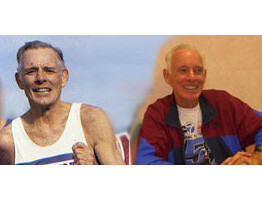 VT and Glenn are to be especially commended since they were racing just three days after completing the rugged Escarpment Trail 30K in Windham, N.Y.
With the cross-country style scoring where the place you finish is your score and lowest score wins, RRR tallied 24 points (1-2-4-5-12) to rout the opposition in the M40 bracket. 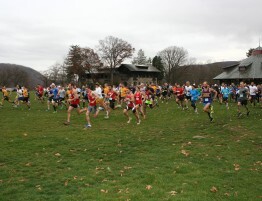 Taconic RR was a distant second with 65 points, followed by Rivertown Runners, 104, and Westchester Track Club, 137. Rockland also captured the M50 category, which counts each team’s top three scorers in the division. Jamie, Logan and Glenn combined for 21 points, enough to fend off the challenge of Taconic, which had 26. Rivertown (57) and Westchester (61) followed. RRR also posted a strong second-place finish in the W40 category with 91 points, behind Taconic’s winning total of 42. Carol Guzinski (26:03), Carolyn Meroles (26:54) and Olga Carriel (27:19) were the Rockland scorers. Taconic’s Suzanne LaBurt continued her torrid racing streak, placing third overall and first in the women’s division in 20:30. A total of 14 RRR members took part in the race, including Jonas Bueno, 13th in 22:54; ageless Alister “Ali” Renwick, 14th in 23:20, as well as Dave Hall, Niels Dua, Eric Shatz and Jeff Greenberg. 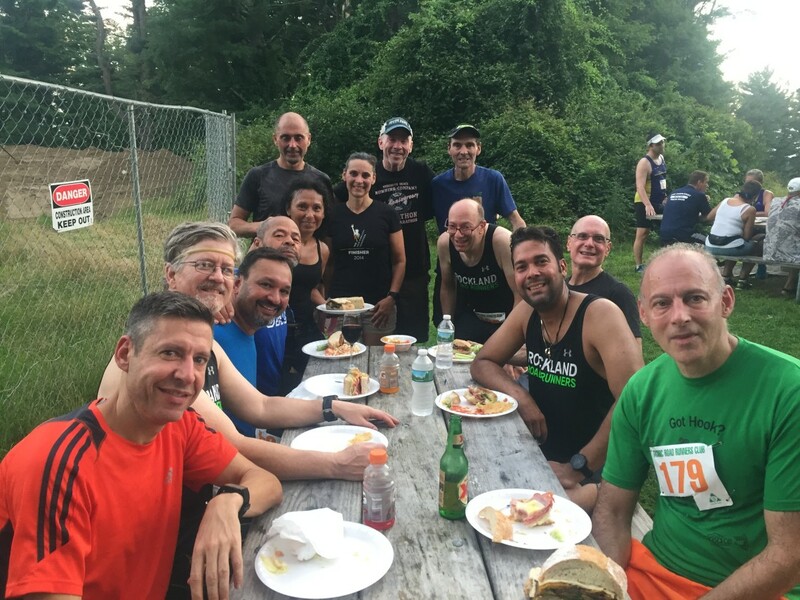 As always, the post-race party was a highlight of the evening, as Taconic again proved a gracious host in providing sandwiches, beverages and wonderful hospitality. 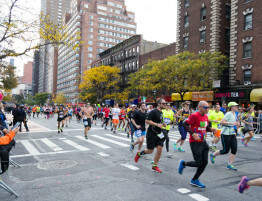 Our sympathies go out to Van Cortlandt TC, most of whose members arrived late after going first to Rockefeller State Park, thinking the race was being held there. 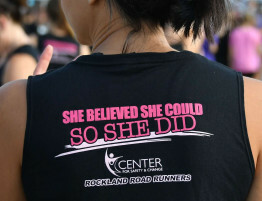 At least they will know where to go next year, when Westchester TC hosts the race at Rockefeller Park!